A new wearable device, NailO, turns the user’s thumbnail into a miniature wireless track pad. Here, it works as a X-Y coordinate touch pad for a smartphone. Image courtesy of MIT Media Lab. Wearable tech meets nail art in the latest invention from MIT. 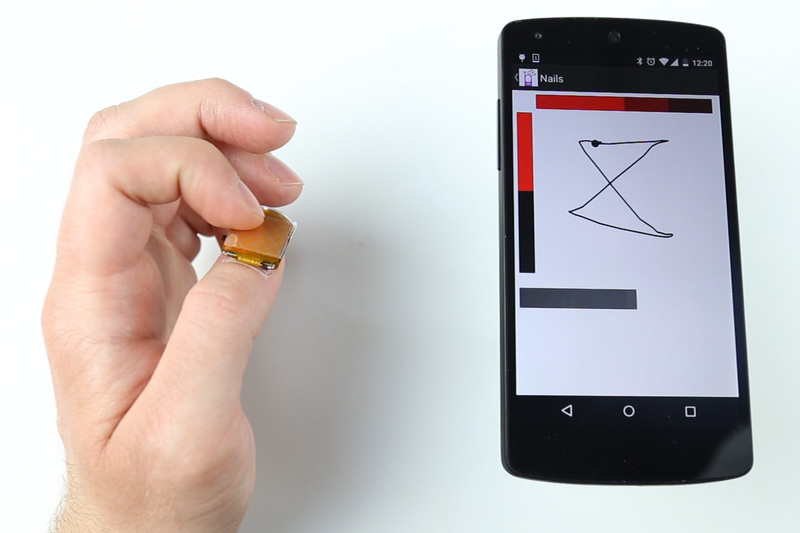 NailO is a track pad that fits on your thumb, and it can control the technology around you. By simply making gestures with your other fingers, you can use the device to covertly send messages, add additional functionality to your smartphone, or help when you’re hands are full or dirty. For instance, if you’re cooking a recipe, but can’t reach over to switch a page on your tablet, you can simply swipe with your index finger to make the virtual page turn. Or, you can use it to create a “finger-painted” smartphone drawing. NailO comes in various colors and patterns, like other forms of nail art, that can match your personal style. Although, I think the full design of the finger wearable will be improved in future iterations. Right now the device is just a prototype, but the researchers have plans to turn it into a commercial product.